Your four-star hotel in Vienna close to Schönbrunn CastleThe four-star Hotel Kavalier lies in Vienna Penzing, the 14th district of Vienna, close to Castle Schönbrunn. Hotel Kavalier offers 144 modern rooms for your Vienna stay. 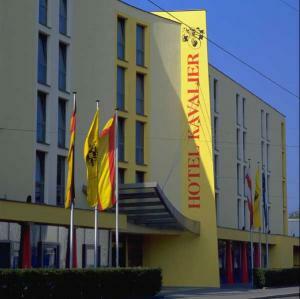 The modern Hotel Kavalier**** lies in the west of Vienna close to Castle Schönbrunn. The name Hotel Kavalier stands for comfort and excellent service all around; every guest is looked after with care. Hotel Kavalier’s excellent location, as well as the excellent value for money, have been appreciated by hotel guests for years. You can reach Vienna’s city centre with all its Viennese sights with the tramway and the underground. In addition, the hotel has its own underground car park and enough bus parking spaces available. Use three fully air conditioned event rooms with a capacity of up to 90 people. The ideal spot for successful business meetings, seminars and presentations. The four-star Hotel Kavalier in Vienna’s 14th district has 3 conference and event rooms with space for up to 90 people to offer for your seminar, conference or business event in Vienna Penzing. The congress rooms at Hotel Kavalier in Vienna-Penzing are the ideal place for your business meetings, training days, conferences and presentations, celebrations and company parties, exhibitions and many other events. The premises are all located on the ground level, have carpets and modern furnishings. Daylight is a matter of course in these quality event premises in Vienna Penzing.No matter what your event is for, all event premises can be arranged individually and totally tailored to your personal event needs.